Saturn moved into sidereal Sagittarius on January 26, 2017 and remained in the first three degrees of the sign until it backtracked into Scorpio on June 21, 2017; returning to Sagittarius on October 26, 2017. Saturn remains in Sagittarius until January 24, 2020. I wish I could simply leave it at that. Look at the data objectively, place it in the diary, and that's that. Analyse it, of course, but stay focused on what is, not on what may or may not happen because of this transit. I wish I could replace any sense of anticipation of what may happen, because a bigger part of me realizes that 'nothing happens, all is', anyway. So why speculate? Why philosophize? The trouble with me and with us humans, is that we have a very well developed frontal lobe and cannot help but speculate! We hope for a better future. This is what Sagittarius represents, more than anything. This freedom loving sign, and those with the sign prominent, like to roam around and explore bigger and better options. We seek the truth, or we seek our truth, a constantly changing phenomenon, which requires adaptability (Sagittarius is a dual sign). Saturn's transit slows us all down in relation to what we believe, so we can evaluate truth, and how productive a strategy of avoiding the truth is. Saturn in Sagittarius gets us to restructure our beliefs to fit in with the reality of the situation, or the other way around, depending on the individual. Saturn's transit in Scorpio was intense. It dredged out much that was unsavoury. Looking ahead, Saturn’s transit through Sagittarius is a time we must ask some pertinent questions about what it is we believe after all the recent revelations. Saturn is a part of us that has no time for wishful thinking, instead preferring to face the cold, hard facts of what goes on in the more recently developed parts of the human brain, granting us the ability to plan, motivating us towards higher causes. When Saturn is in Sagittarius, we can either experience a realistic sense of what is possible, or a dogmatic rule of thumb which plays on our deep-seated sense of insecurity. A great deal is possible if we can think and act responsibly while Saturn moves through Sagittarius. Sagittarius represents the faith we develop in ourselves after having been through testing times. We can either become open and inclusive with our unique set of beliefs - our truth - or we can become too rigid, digging our heels in and become dogmatic. If this happens, we are not able to sway with the circumstances, and lose our footing when life insists we look at reality, while our idealistic view of the world creates stress if placed at a juxtaposed position. Some may give up and drop to their knees and pray aloud, while others silently make wishes in the hope that someone, or something divine, will hear their prayers. Others still, make statements, affirm; trying to trick themselves into believing something is true, when in fact it is not. Saturn's transit in Sagittarius will not let us get away with avoiding the truth; no matter how many times we may affirm otherwise. Those who are more firmly planted are more able to reach to greater heights because of a sense of being rooted. This is beautifully captured in the image of the centaur, a creature that is half horse, half man, roaming around freely and yet firmly rooted in nature, never disregarding the natural laws, as it seeks out new adventures - sometimes throwing out the rule book in order to feel free. ​Sagittarius represents law and order, so Saturn's presence here can be rigid if we do not adhere to the natural order. We can do so much more when we have all the facts, when we respect the boundaries of what is possible. So, let us be factual. Those with Saturn prominent are truth seekers. Yet they may also become too fixated on finding the truth, and not realize they are being too subjective. Saturn offers more objectivity. Saturn in Sagittarius requires us to bravely go where we have not gone before. But this can only happen after we have faced our fears, having dealt with our demons while Saturn was in Scorpio. The Buddhist phrase, 'No hope. No fear', never really provoked too much thought in me. Why would I want to live without hope? Indeed! The problem with hope is this: When we hope, we fear losing all hope. And when we fear something, we hope that one day it will get better. Hope and fear are both intrinsically linked, so that we cannot have one without the other. Fortunately, there is a gap we can slip out of and in between hope and fear, and it resides in the place Buddhists call 'The Middle Way'. It is a place where we live in a state of wisdom. According to the Buddha, it describes the ‘Noble Eight-fold Path’, to achieve Nirvana, or Moksha (both words meaning 'liberation'), instead of employing extremes of austerities and sensual indulgence. Anyone with the sign Scorpio prominent will know this struggle very well, a struggle with our inner demons, with dark forces. 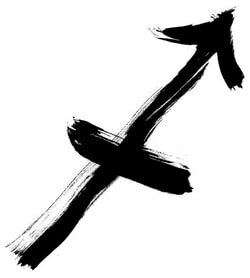 This struggle ultimately leads one to 'let go and let God', represented by the sign Sagittarius. This takes us from the depths of fears in Scorpio, to a faithful step into the unknown in Sagittarius. When all our worst fears come true, what else is there to do but to get on our knees and pray?! We can either form a way of living within the laws of nature or we are overcome by fear and fall in with others' laws, impressed upon us by those who seem more sure of themselves. This is how religions become so prominent. Although there is much to garner from them, they mostly play on fears. The ruling elite continue to bring shocks and upsets. The conjunctions of malefic forces in Sagittarius bring with them a dip in ethical behaviour. Initially, we will see Saturn's transit in Sagittarius play out with ill-conceived, hurried laws and policies replacing ones that are currently collapsing. But new governments, putting in place new laws and policies, will not take long term implications into account because of Saturn's weakness in Sagittarius. This leads to new hopes and new fears for a brighter future. Jupiter is the counterbalance to Saturn and the planet which rules Sagittarius, so Jupiter’s position in the sign of equality, Libra must be considered. Saturn and Jupiter both influence Gemini and Aquarius by special aspect(1) until October 2018, bringing intense scrutiny to the media's role (Gemini), as well as humanities future direction (Aquarius). Looking further ahead - in true Sagittarian form - we can see further destabilization in the world leading up to Saturn’s conjunction with Pluto in late 2019, and then with Jupiter in 2020. Jupiter moves into debilitated in Capricorn at the time of its conjunction with Saturn, leading to a global wake-up call; financially and morally. New hopes for a brighter future inevitably lead to new fears when such hopes are threatened. And new fears over a growing sense of doom, inevitably lead to new hopes for a more realistic way forward. Slowly we venture, onwards and upwards. 1. In Vedic astrological analysis, Saturn and Jupiter have special planetary aspects: Saturn aspects the 3rd and 10th houses from its position, while Jupiter aspects the 5th and 9th houses.